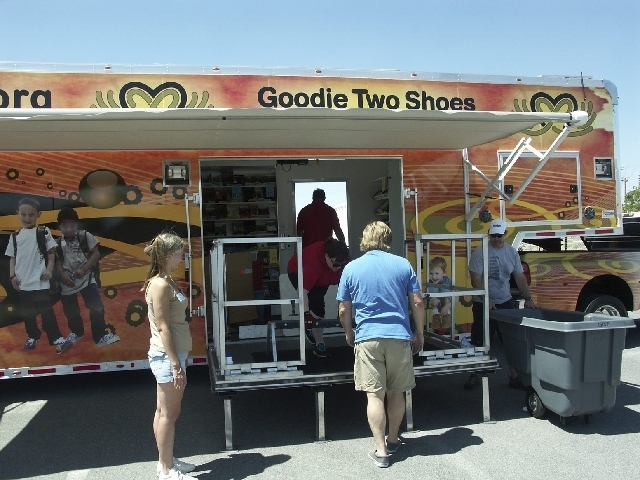 The Las Vegas-based nonprofit Goodie Two Shoes Foundation (GTSF) provided their first pair of brand new shoes for disadvantaged children in southern Nevada in 2003. Ten years later the foundation is still supporting low-income families in the Silver State. Saturday, volunteers were at NyE Communities Coalition with their self-described mobile shoe unit. The relatively new 48-foot, custom “shoe-store-on-wheels” takes GTSF’s services directly to children in need where the organization has set a goal of serving 10,000 children per year. Co-founder and CEO Nikki Berti said Saturday’s event saw a very large turnout in the Pahrump community. “It was great. We actually outfitted about 300 children in partnership with NyE Communities Coalition. All of the kids were selected based on need and we are very excited we were able to service 300 local kids going back to school. “Goodie Two Shoes has actually helped to support the community for the last four years. We come out in August and work in partnership with different organizations to identify kids who are most in need,” she said. GTSF believes strongly in allowing the kids to select and make their own decisions on what style, brand and color they prefer. Berti said it’s the only time where parents are omitted in the decision-making process. “The premise behind what we do is to provide kids with new shoes and socks. We really try to empower kids with choice by giving them the opportunity to select whichever pair of shoes that they would like. “Our volunteers ensure it’s a properly fitting shoe, but the children make the selection. We are primarily out of the Las Vegas valley and this is the only event that we do outside of Clark County. We started in 2003, but we became a foundation in 2007. Since then we have outfitted almost 37,500 kids,” she said. Local parent Lydia McCoy was able to get her three kids outfitted with brand new shoes on Saturday. She said the program is a great benefit to all Pahrump families. “I am truly elated because it is such a huge help for parents who are struggling. I have been out of work for four years. Up until now, I have been salvaging broken appliances just to get money for gas, much less their clothes. My kids were able to get shoes, school supplies, backpacks and socks. So it is wonderful. The shoes are very high quality and brand new. It is a huge step up to us who are struggling,” she said. McCoy said it is only out of necessity that she takes advantage of the services provided by the agency. “This is actually our second year. We have been in Pahrump since about 2007. The last time that we came out here was in 2010 and they had everything organized and you had to go through one of the social service agencies to get a voucher. They have you wait in a different area and the kids get to pick out their shoes. If they get something flickering with neon lights then that’s their choice and now they are all set for P.E. and the rest of the school year,” she said. McCoy’s daughter will be entering the 10th grade this year. The shy young girl’s reaction to her new shoes and backpack was justifiably understated. “It is really helpful. I got these shoes because they are very comfortable, they look good and they will really help me out with P.E. this year. They’re also kind of fashionable,” she said with a smile. GTSF serves children ages pre-k to 21, referred by schools, social service agencies and other nonprofit organizations dedicated to assisting children in need.